Before I knew what an Empath or an Energy Sensitive Person was, I used to pick up thoughts, feelings and sensations of people around me. It confused the heck out of me. Since then, I’ve (thankfully!) learned how to easily tell the difference between my energy and someone else’s. Check out the video below to learn the trick! Have awesome tips to share? Comment below! Thanks really helpful. Will give it a try. Great! Let us know how it goes! Glad you liked it, Lynette! Thank you for your post. It helps to explain some of the things that I experience. 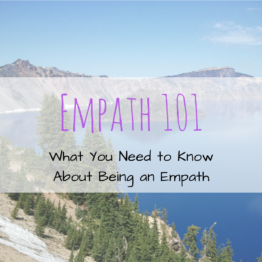 I am not sure if I am an Empath or just sensitive but either makes sense. I have gotten very good at building walls or retreating into a state of emotional apathy, so unfortunately it makes it harder for me to sort where I fall in the spectrum (I have 3 jobs in customer service). So thank you even more for the resources you release to help us find answers! You’re welcome! Happy to help. Thank you for sharing. I have done a lot of work on myself and I’m able to distinguish what’s mine or what’s other people’s energy but I’ve noticed when people are stuffing their emotions or going through a tough time, I will start crying. Once they’re gone, I’m fine. I let it flow through and let it go. I don’t feel drained or anything afterwards. Is this just me helping them to release some stuck energy?